So here it is. 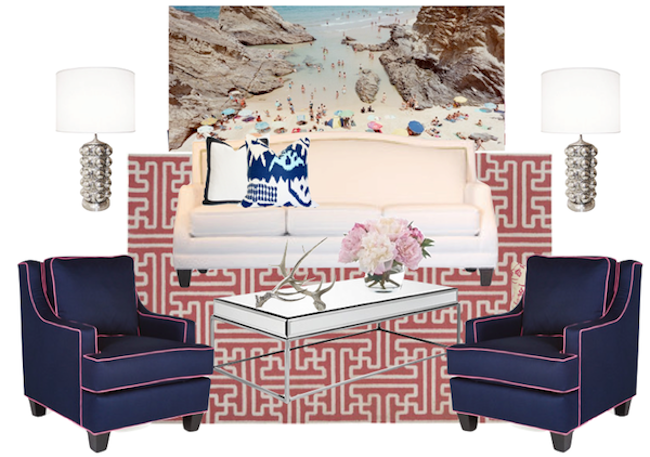 I've been lusting after this greek maze rug for too long to admit, and I'm a big Society Social fan, when I saw these fab pink piped chairs, I just couldn't pass them up. I figured since Marc owns and wears pink pants and shirts on the occasion - he wouldn't mind it in the living room - right? .Too much? Not enough? What are your thoughts? love love love those chairs! Society Social is my fave. I love anything with contrasting piping. I love the art!